So we are on day 8 with above freezing temps for daytime highs and I am still smiling. At first I was a little surprised at how well my attitude was during the week, but then came to realize why wouldn’t it be? We were getting above freezing for daytime highs, but the air was dry and the snow was not even getting soft during the day. At night, temps were dropping off into the teens and low 20’s, so that would firm everything up. In addition to the mild temps, we had tons of sunshine during the day and clear skies at night. If I had not known any better, I would have guessed it to be the middle of March and not the middle of January. Given blue bird skies in January up here, with little to no snow loss, no wonder why I was loving the weather so much! It also reminded me a lot of the climate in the mountains out west. Tons of snow on the ground, loads of sunshine during the day, nice mild temps during the day, but because the air was so dry, that warmth did not get transferred to the snow very well and it would remain powdery, even in the sun with air temps in the upper 30’s. By Thursday night, the clouds rolled in and kept temps from getting too cold and since we have had clouds, mild temps, some melting and even a bit of rain. Not much rain. Less than 1/4″ I believe. The cloudy and damp weather has been a little harder to stay positive about, but I really have not gotten sad about the current state of things up here. I suppose it helps to see the end of the thaw coming in the next 24 hours or so and even a bit of snow to freshen things up. No big dumps seen in the next 7-10 days, but enough to freshen things up and make it all white again. It looks like areas that are currently in more need of fresh snow will be the areas that get the most fresh this week too. Much of WI, southern MN, northern IA and areas of lower MI. All our trails will need is 3-5″ of fresh system snow, or double that in LES and they will be back to being in great shape. 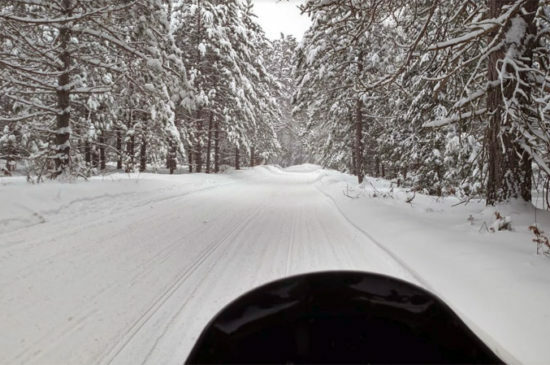 The woods will need a good foot of fresh to bring them back to being a lot of fun, but the snow that is down now will be an awesome base to put the fresh on, as well as provide for some awesome spring riding. I have enjoyed the week off from having to move snow! I don’t mind the actual activity of doing it, but the time it takes up has been able to spent on other things. I am at a record early pace to have all my stuff together for taxes. Just need to wait on the forms from my customers and Nora’s work and I can get all my stuff to the accountant. He will probably think it is some kind of a trick being played on him with me getting all my stuff to him in a month that does not start with the letter “A”! Anyway, back to the goings on in the Keweenaw. I have come to the conclusion that trying to forecast snow gain is much easier than snow loss! I really thought we would be in worse shape this week than we were. As mentioned, the untouched snow around our house was actually powdery when the temps were above freezing and the sun shining brightly. 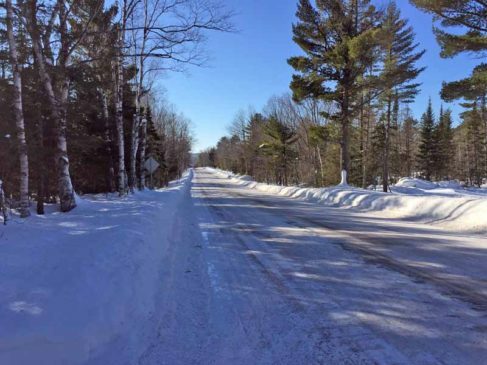 Even the snow on our road hung on until Friday when the humidity rose. That last picture was taken Wednesday afternoon. I almost put a special post out saying that anyone that had time and wanted to enjoy some great trail conditions, with beautiful riding weather to come up. However, I really had no idea when things would start to go down hill and anyone reading such a post on Wednesday would have likely arrived here on Thursday and woke up to things going down hill Friday. Perhaps I will make an effort to keep tabs of things as the week progresses to keep you all informed for next weekend. Needless to say, with all the sunshine and warm temps, the snow on the roofs was clearing nicely. However, not all of the snow was coming off. There are just too many angles and valleys on the front of the addition to let things slide naturally there. It sure looks pretty, but is a snow holder for sure. So I called some of the faithful workers that have come in the past to shovel snow and even cut wood and they came over on Saturday to clear. Just as we were getting going, the snow on the back side of the wood shed sled. It shook the whole woodshed pretty good, but it did not fall down! Always a plus when that happens! Actually seeing it shudder like it did, I think I may look into beefing it up a bit more. There was a TON of snow on it, so it was asked to withstand a very strong force, but I still did not like the amount of shaking that happened! Usually when one side of a roof clears and the other is on a similar slope/condition, that other side will clear as well. No such luck with the wood shed. The front roof does have a lower slope, but everything else was the same. So when the guys were up on the addition roof, shoveling it off. I broke out the roof rake and pulled off the snow from the eaves of the woodshed roof. When I was done, I could not believe how much snow was on it! The folding down of the metal roof on the eave also happened last winter and I failed at extending and re-enforcing the rafter tails this past off season, but will in the upcoming one! Pretty soon, that metal is just going to break off like a pop tab! 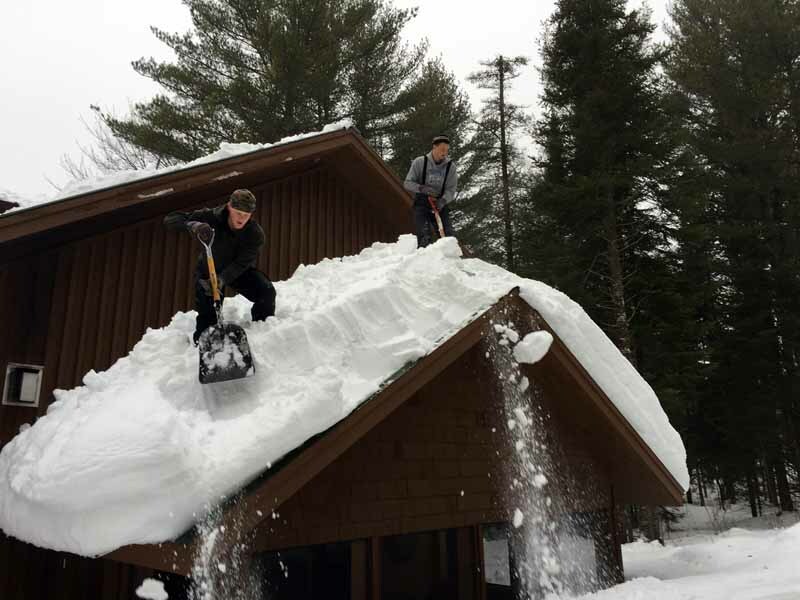 The snow clearing of the addition roof went well. Even though I was not up there doing all the “heavy lifting”, my mild was still spinning to come up with a device to make it easier for them. I did come up with something and plan to try and make it this summer. I don’t think our roof will need shoveling the rest of this season. I want to keep it a bit of a secret, as if it works as well as I think it might, I might have a little money maker. After clearing the main section of the addition, the guys hopped onto the roof of the screened-in porch and got busy clearing that one off. 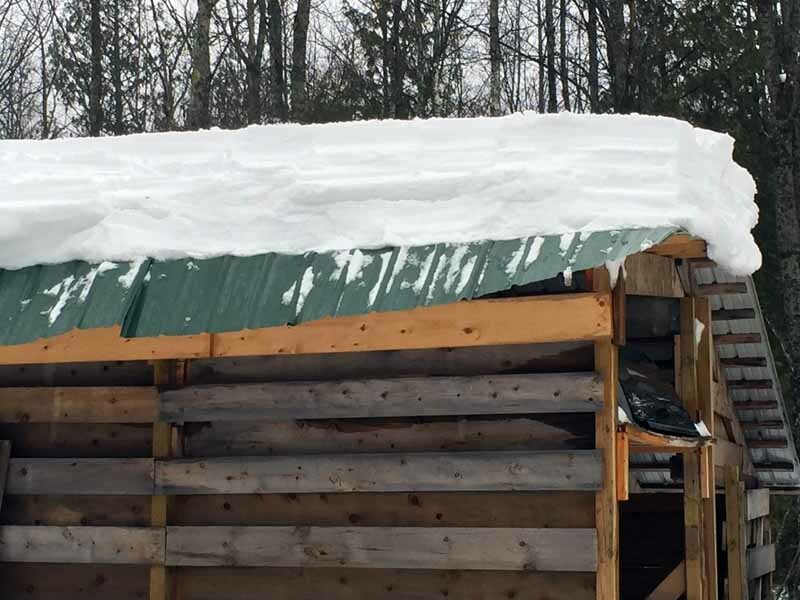 It is the smallest section of roof we have and also has a pitch steep enough that all you need to do it get things rolling and the snow will continue its way to the ground. Once they were done, then the local inspector made her way over to make sure the job had been done to specs. 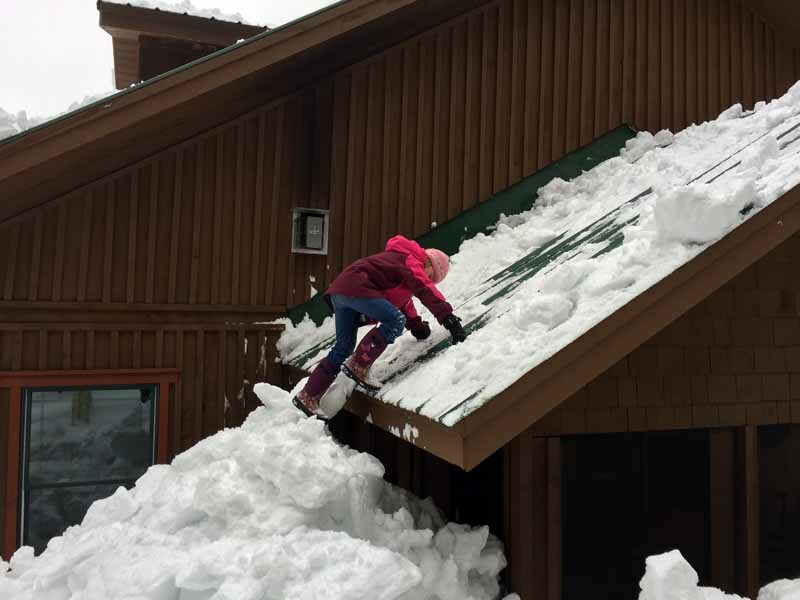 How many of you got to play on snowbanks that went right up to the eaves of the roof when you were kids? The UP sure is a unique place in more ways than one! Speaking of ways that the UP is unique. How many other places do you know that after going through 6 weeks of snow that produced 180″, along with bone chilling cold and winds of 50 mph will have an insect flying around the first sunny day with temps above freezing? True story. I actually saw several different kinds. One looked very much like a mosquito, but I do not believe it was one. The other was a very small moth-like creature. The really funny thing is that as they were buzzing around me, they were really not bothering me at all, rather it was like they were trying to have a conversation with me. Something like “nice weather we are having Eh?”. Well, I guess that about covers it for this one. It will be very nice to see the snow start to fly around up here. The break has been nice, but also a little weird for this time of the year. 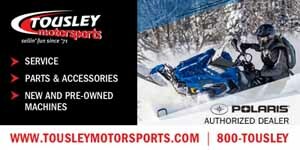 Plus, there is a lot more snow play that needs to get done, as well as MI Tech’s Winter Carnival and even the CopperDog 150 dog sled race! So bring it on Mother Nature!